Greetings!... from Florida, the land of swaying palms and pink flamingoes. Actually we're home... been back for a while. Came home to two mailboxes jam-packed with letters, magazines, and circulars meant to be collected upon our return. Obviously, someone missed the memo... the one mistakenly delivered with the rest of our mail. And in the mail were official notices... two from the courts, federal and county, for jury duty, and another from the township, about a water main project beginning on our block the very next day! Welcome Home!... to life and its many surprises. Much like our trip to Florida, where our biggest surprise was winning the lottery! That would be the TSA precheck airport lottery, traveling in both directions, when we were randomly selected to forgo the crazy rituals of removing our shoes, belts, metal objects and having our carry-ons and electronic devices overly scrutinized. Instead, we were given quick passes to our terminals without any delay... well maybe just one, when at the last minute, Michael was also chosen by security to have his hands swiped for explosives. Twice! Random or deliberate? That would be Michael, my husband, the once suspected 'alarm'-ticking terrorist (for details see 'Travel: To & From Florida... Part 1). And once on-board, there were more surprises... roses and fluted glasses filled with champagne served to those of us in Coach!... 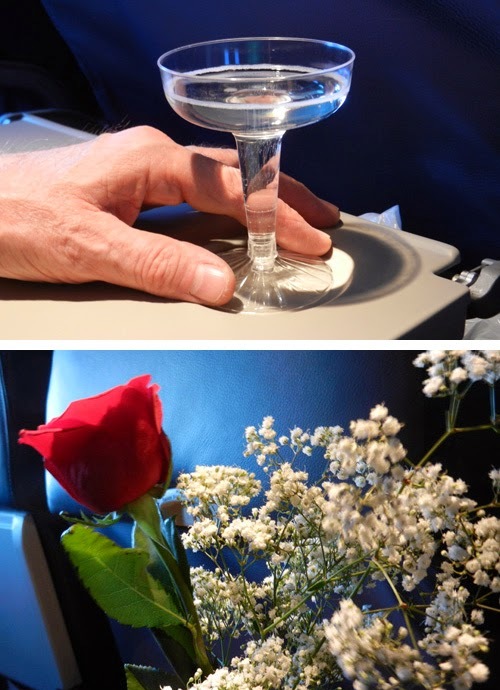 while someone in First Class knelt down on one knee, and with confidence proposed marriage! Talk about long distance relationships and commitment! This engaged couple had been taking turns flying USAIR, every weekend, between Philadelphia and Fort Lauderdale for the past year... just to be together! 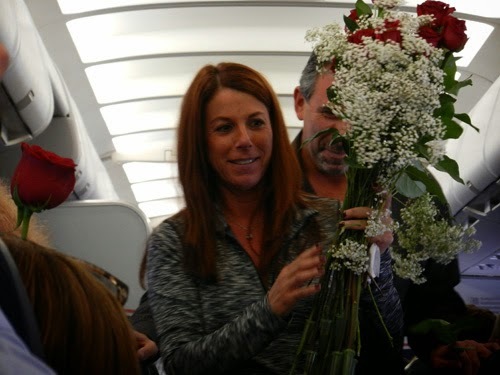 Here's the 'bride to be' walking down the aisle collecting roses and congratulations from passengers and crew after saying yes to her in-flight proposal. What entertainment!... Better than watching a movie! Do they still show movies on planes or did that disappear with free meals? Speaking of meals, we had some good ones once we landed... upscale French, authentic Italian, classic American. Besides tasting good, the prices were crazy good too!... early bird specials (full-sized meals at reduced prices) and 2 for 1's (two meals for the price of one)! 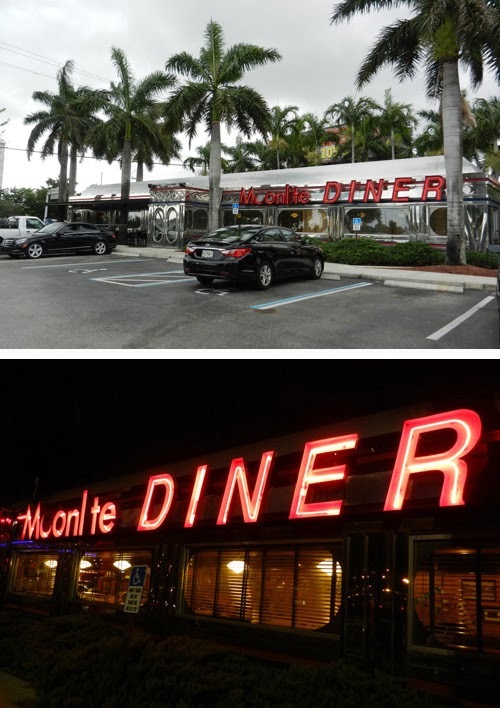 Here's my down-home favorite... the Moonlite Diner. I could eat there day and night, which obviously we did. 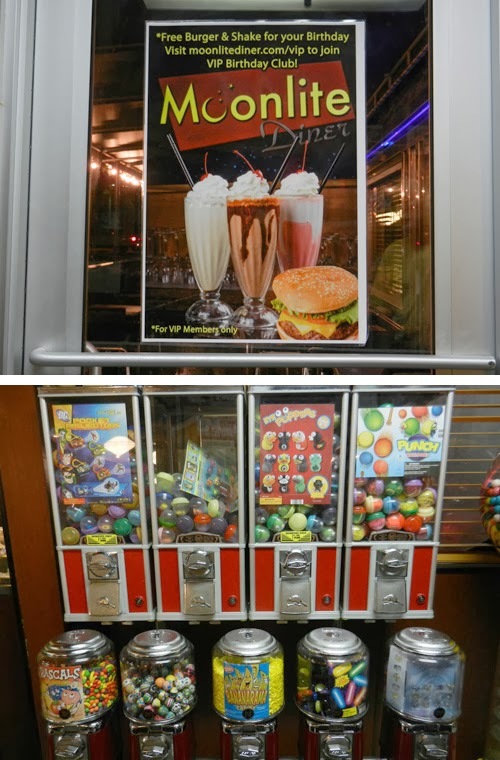 Besides the super-friendly staff, really good food, milkshakes to die for, they had vending machines filled with plastic toys! Here are some little Domos I got for 25 cents apiece. Cheap thrills... a quarter in the slot and turn... even the colorful capsules are cute. The xylophone caught my eye while shopping for bottled water at Publix, the local supermarket. 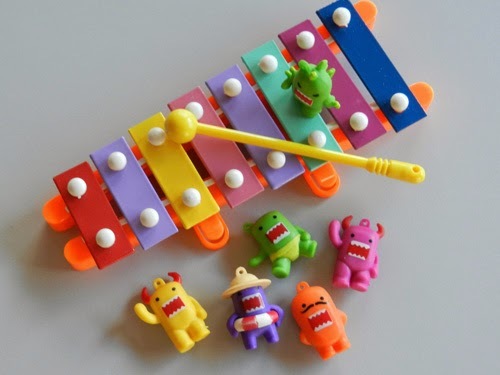 For a teeny toy, the small sound is surprisingly good. For big sound... we attended a four-hour musical event with two films and a lecture at the main branch of the Fort Lauderdale Library... a library with its own theater and a budget to produce a free six-week series focusing on great American musical genres. Our genre, the last in the series, was from Mambo to Hip Hop with performances by Miguelangel Estampa, 'Flamenca: Music of Cuba and Rumba Flamenca' and a Hip Hop performance by VerseWon. 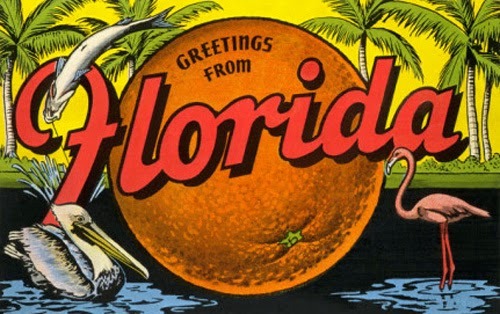 At least once, I'd like to be in Florida during the annual International art exhibitions of Art Miami and Art Basel. Unfortunately, during this visit, all the museums were closed in preparation for these upcoming events, but to our surprise, the Wynwood Walls and nearby galleries in Miami were open. Here's some street art from the surrounding Wynwood area. 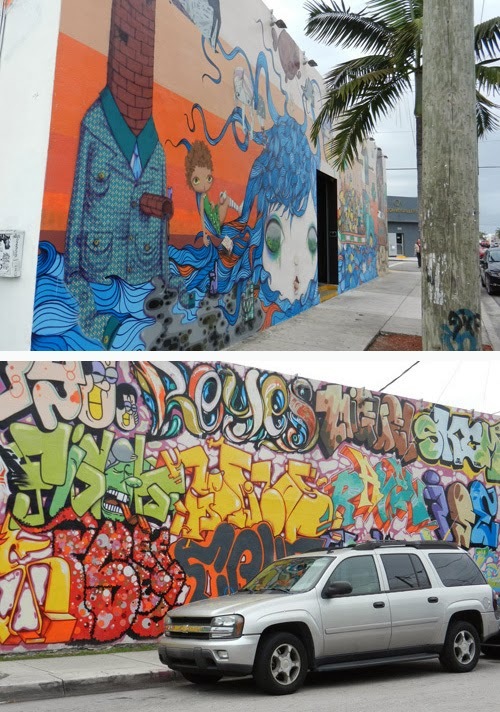 For more about the Wynwood Walls go here and for their website go here. Here's work from a couple of Wynwood galleries. 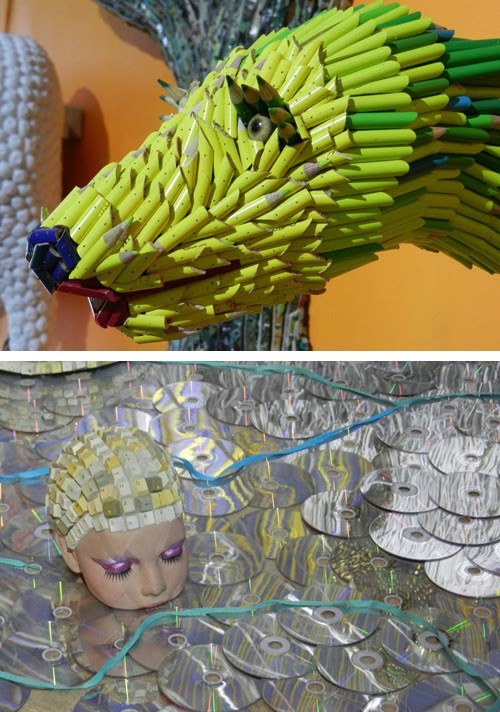 The first two pieces are by Fedrico Uribe from his installation at the Now Contemporary Art Gallery. For a video by Uribe go here. These two works are by Carlito Dalceggio shown at the Ricart Gallery Miami. 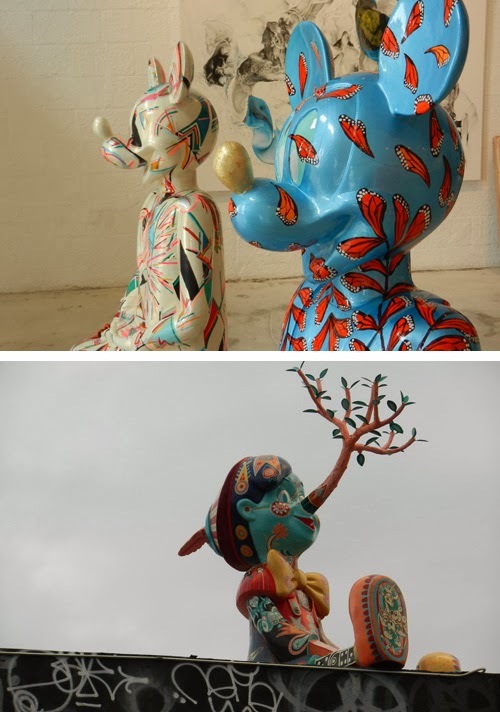 Mickey was in the gallery while Pinocchio was on the building's rooftop. The making of an installation by Dalceggio here and an article about him in the Miami New Times here. What we didn't get to see was the ocean... never walked the beach, never collected seashells or colored, polished glass. We ran out of time. Besides, we weren't on vacation. We were here to spend time with my mother, who resides in Florida. So when we weren't all running around eating and doing a few cultural events, we were busy with mom and her new iPad, a gift we gave her. For someone with no computer skills, my mom is sharp!... both smart and youthful beyond her years. She can now download apps, email, use the internet, take photos, read newspapers online, play Scrabble and win, and decipher an iPad manual! 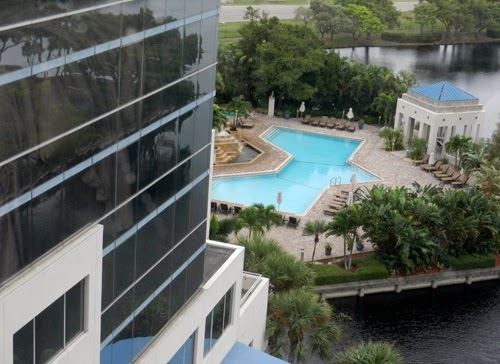 Here's a photo of mom's condo pool taken with her iPad. 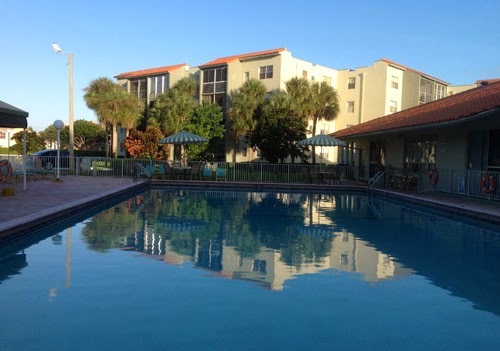 Here's a photo of our pool at the Westin Hotel, Cypress Creek, taken with my camera moments before heading to the airport on our way home. Goodbye palm trees... hello home... and time for poetry! Safe travels and may all your returns be welcomed. Now your house must be smiling and welling up with joyful tears! With the return of its guiding spirit and appreciative loving caretakers," that place that knows your name" is a home once again.. Though you didn't make it to the beachy and traditional coastal haunts, methinks something from all that Sunshine, provided enough light for poetic gratitude and images that suggest lotsa magical realism. Florida never looked so good! An interesting journal -- love the marriage on board, and the art pix. What a cool way to propose! Made for an entertaining and pleasurable trip on the plane for all the passengers. Love the Wynwood Walls! Great idea! They need a place like that in Philly....might cut down on all the grafitti. How long are the murals displayed? Do they cover over them to add new art? It would be a shame to cover them over, though. Sounds like you had a wonderful visit with your mom. Bet you wish you were back in Florida now! Welcome home to snow and freezing temperatures! The thing I hate most about going away is coming home to the piles of mail.